During my time spent with the Real Time Abductee group this past year I was lucky enough to sit with each of the six members for one on one conversations. It was a time for me to find out what each member of this rare group of people wanted me to pass on to my readers. Some of the time I spent alone with them involved discussing the events they had experienced as well as opinions and warnings they had for those of us who have not encountered the things they have. I was curious to find out how their experiences influenced their thinking on some of the subjects I write about. As I spent time with this unique group of people I quickly learned that they do not think like the average person and have very strong opinions on many subjects. What I was told during these chats has changed the way I think about many things. 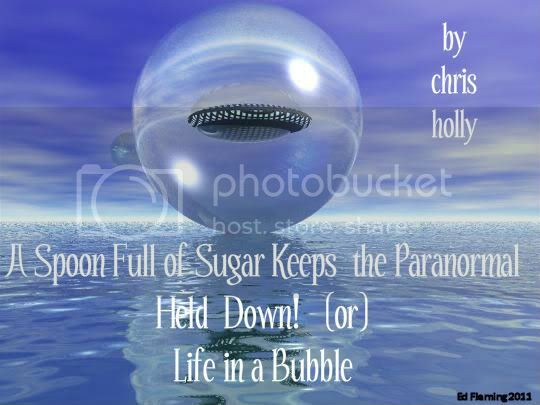 The female abductee I will be writing about in this article has focused in on what she describes as the " Spoon Full of Sugar " method of dealing with life by many of her fellow human beings. She told me she has become fascinated with how society has be taught and uses the sugar method to deal with reality to the point that most reality seems to be long lost concerning many subjects. By sugar method this woman is referring to how many people seem unable to deal with life on a 'as is' level and go about their thinking and lives by locking away the things that are too harsh or hard with a coating of fake surroundings or thinking in order to NOT deal with real life. She feels far too many people sugar coat or ignore real truth for a far easier digestible yet false bubble of denial on many subjects and issues they encounter in their lives. Living in fake bubbles is a safe and simple way of blocking out the hard truths of life allowing for a far sweetie existence . She points out it is a far more dangerous method as well. Living with blinders can bring devastation when real life comes knocking at those living in selective bubbles . This lady feels that many people spend their lives blocking out the difficult issues by simply ignoring they exist. She told me she has watched many people walk around with blinders on carefully living in serious bubbles of denial securing them from all things they do not want to hear, see or deal with. Ultimately those living in this method become destroyed when a real truth enters their spoon full of sugar false existence. She told me this false way of living is going to have devastating backlashes now as the world sinks into deep trouble on many levels. Those who have traveled life in a sugar coated bubble do not seem to be able to conceive of or deal with the harsh realities they are now facing. People losing their homes and jobs or those who are no longer able to afford the life style they once had seem blindsided by what she feels should have been obvious due to the course the world was traveling. Living in a world of denial is a strange creation by those living in our time that she chalks up to a society fed fantasy and controlled by media , television , and Hollywood . We are a brain washed society. We have all been told to look over here at this lovely view of the world as we ignore a great deal of the real world and real happenings around us. This lifelong real time abductee feels this Spoon Full of Sugar thinking or non- thinking is clearly seen in societies view of the paranormal. She reminded me how I once told her about the emails I received over the years from people complaining that my articles were too harsh. One woman in particular comes to mind who sent me a long email years ago demanding that I stop writing the kind of articles I do as they frighten her . She scolded me and told me that if I cannot write about things like vampires and aliens as good beings like us that are here to help us she was not going to read my stories any longer. I was a bit stunned that a grown adult felt this way and replied by telling her I was sorry she did not like my articles and that I was not a fiction story writer but someone reporting events I felt were true by real people who experienced them. I told her I wrote about the events as they were reported which were often far from lovely stories. The Abductee reminded me of another incident that occurred during this past summer when I was spending time with the real time abductee group. I was sitting at my desk writing about my conversations with the abductee group when I received a phone call from a woman who wanted to set me straight about the world of aliens and UFO's. The woman sounded as if she was an average middle aged lady with a large opinion on this subject. The purpose of her call was to tell me that I need to get a grip and watch a few of the Star Wars movies so I can understand the UFO and alien subject. At first I thought she was joking but quickly learned this adult woman was serious as she went about blasting me on the phone for writing about aliens as I do . She yelled that I was trying to frighten everyone by writing that we should fear other beings when it is a fact they are all neighborly and friendly which is well known and I am sick to think people need to fear them or the crafts they fly around in. Not only was she upset about my stating that we should be careful and not try to approach a craft or being that is unknown - she was furious that my articles were not full of love and sometimes terrified readers about things considered paranormal. She told me that many of her internet friends have been taken on lovely journeys in UFO's and that aliens are here to only help us and show us the ways of the universe. I asked her if she considered the fact her friends may be the ones not being truthful and that the reports I write about may be what is true and happening to people all over the world. The woman burst in to a rage screaming at me things that made no sense at all and slammed down her phone. Obviously I placed a big pin in the fantasy bubble of her ideas concerning the subjects of the paranormal. The abductee reminded me of these events and how extreme the woman reacted when I shook her little bubble with a injection of possible reality. Not only did she react strongly she became frantic with the idea that the real world had a different view of things she obviously could not deal with. The real time abductee pointed out that far too many people, due to the brain numbing , brain washing effect of the internet, Hollywood and slew of paranormal based television shows , have far too many people locked in Sci- Fi fantasy bubbles when it comes to things we consider unknown . She fears we have allowed our thinking to be shut down and tarnished by what is fun and easy to digest when it comes to subjects that may be too difficult to handle. She considers the idea of strange beings taking us at will without any available help or understanding easier to handle if we simply toss it in the box with a great Star Wars scene they loved in one of their favorite Star Wars flicks. The problem this abductee has with this way of handling things is that she is afraid it can or is being used as a control device by others who may benefit of want us detached and void of real truth when it comes to subjects like UFO's and aliens or alien abduction. She feels it could be an intentional push by something greater and more in power than we realize to keep us detached and distracted via the fantasy that fills our lives and keeps us in safe bubbles with sugar fed views of things that are serious and potentially dangerous for the human race. Her fear is that by our living our lives in sugar coated selective bubbles we see no evil , hear no evil and speak no evil about some very evil things that many poor humans do endure at the hands of some unknown power . Years ago before we were force fed by way of a large volume mixed bag of a small amount of truth covered over by mounds of fantasy via technology we had to deal with the world as it truly was. We had to work with nature and the land to feed and shelter us in order to survive. We could not look the other way when things became unpleasant or we would starve. Today we know our food markets will be fully stocked when we get there. Whatever harshness went on for others to provide it means little to those floating in their sugar filled bubbles pushing filled food carts . Before we took this road of fantasy we needed our families, neighbors and friends to survive and thrive. We had to look in to their eyes , touch their hands and talk to them one on one to keep going day in and day out. The fear is and message to all of you from this abductee is that living in a selective bubble of how you want life to be instead of living life truthfully as it exists may be the downfall of humanity. Even more this lady fears we have not become this way on our own accord or by the circumstance of modern living. She fears that this has been a road we have all been herded down purposely by others that find it a easy simple way to control us. How simple it is to dumb us down from truth by throwing a good movie at us . How simple it is to break us apart by dividing us in to little bubbles of false thinking where we live with far less contact or closeness to our species . I think about her fears and realize she has a point. Not only with the subjects of the paranormal but many major subjects that are of extreme importance to us at this point in history. Are we being truthful about the world around us or do we all pick and choose the line of reason that is the easiest for us to handle that allows us to hide safely in our fake sweetened bubbles ? Could it be we have all been walked into a way of thinking that will one day destroy our strengths and leave us alone and broken? Far worse can this fantasy choice of living in selective reality that makes us happy be replacing our sound minds with fantasy filled brain washing that will one day destroy humanity? I listen with care to the members of the real time abductee group. I realize that they look at our world and our species with very different eyes. I know they were good people going about their normal routine of daily life when something very strange interrupted their life , took them, changed them and threw back down among us once again. I know they do not consciously recall many details of what occurred during their lost time events. I also know it has changed them and made them far more aware of many things we never even think about. I hope some of you can benefit from what these people have to say as they seem to see to the center of things while the rest of us seem to remain lost and drifting in a universe full of strangeness and unknowns. I imagine the events they endured while looking directly into the eyes of the unknown has given them a view of life from experience that only those who have known can understand. Be careful out there. I hope one day all humans can once again live a sugar free non bubble life of truth , united , connected and strong. Let your skies be blue, your nights filled with the kindness of others and your hearts full of love. Stay human. When You Least Expect It - A Strange Day Overhead! UFOs and Physicists or a Belly Full of Bullies!